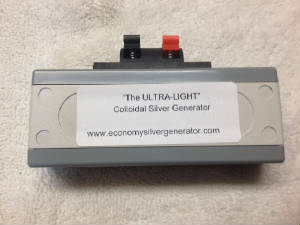 Only 4" by 1" by 1 1/2"
This is the newest addition to our line of Colloidal Silver Generators. (To see our other generators - click on the HOME page to the left) This generator is called "THE ULTRA-LIGHT". It will literally fit in your shirt pocket. 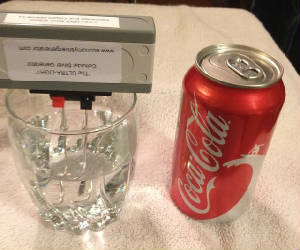 It is smaller and less powerful than our other generators but is ideal for making small batches of colloidal silver (4 to 8 ounces), and great for traveling, camping, hiking or emergencies. A truly "portable" CS generator! 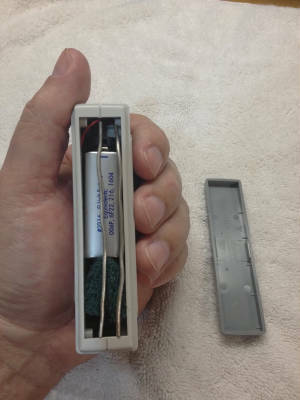 As you will see from the below pictures, everything you need for this miniturized kit comes INSIDE the generator! 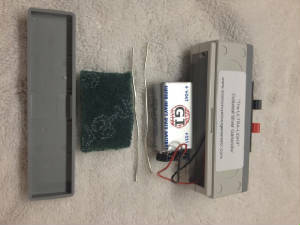 The generator kit includes the wiring, connectors, one 9 volt battery, two 3 1/2" (.9999) 14 gauge (.064mm) silver electrodes and a small scrub pad for cleaning the electrodes (all INSIDE the generator!). We will also include instructions to get you started. 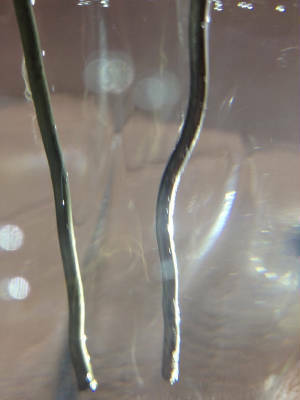 This is ideal for making a small batch in a 8oz or 16oz glass as shown below. Everything you need INSIDE the generator! 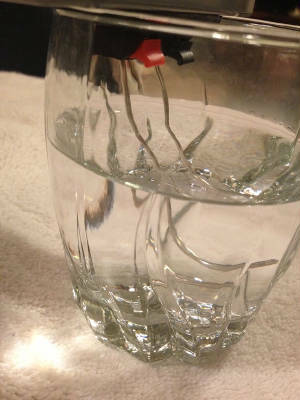 Making CS with one 9 volt battery! For only $39.95 and with FREE shipping! To order checkout below. U.S. and Canadian residents only. Payment accepted in U.S. Dollars ONLY. One complete ULTRA-LIGHT CS generator kit with battery and electrodes, includes instructions ($39.95) - FREE shipping. TWO complete ULTRA-LIGHT CS generator kits with batteries and electrodes, includes instructions ($74.95) - FREE shipping. One complete ULTRA-LIGHT CS generator kit with battery and electrodes, includes instructions ($49.95) - FREE shipping. TWO complete ULTRA-LIGHT CS generator kits with batteries and electrodes, includes instructions ($94.95) - FREE shipping. 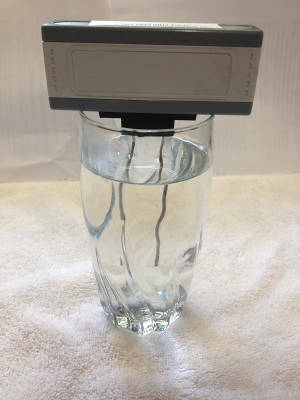 To purchase a TDS meter or to see our other CS generators and products, go to the pricing/checkout page or the AC-52 page to the left.